I believe in the power of the Internet and the sharing of knowledge. Welcome to international global collaboration at our award winning website. My brother and I is a highly educational story about two brothers sharing a room and not getting along very well. The message is highly educational and the work is relevant to my children and their situations with siblings. 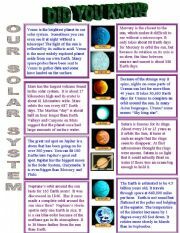 Also contributes a wonderful oral discussion in class. I thank Jessika for the template, enjoy. At the supermarket is a nice story about a family shopping at the supermarket, it includes reading comprehension activities such as open questions, true or false, opposites and synonyms. Really useful and enjoy, Thanks Jesika for the template. 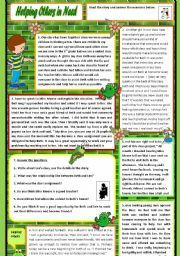 Our family tells the story about each member of the family including the dog, it is very relevant for reading comprehension and vocabulary building. It is also great for oral conversation in class, enjoy!! I love reading your lovely comments. Hugs!! 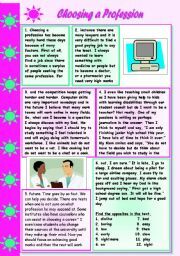 Choosing a profession (2 pages) is an educational story about choosing the right profession and the dilemmas that go with it. 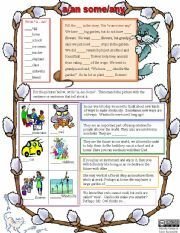 It includes reading and writing comprehension, reinforcing vocabulary skills, and enlarging vocabulary with profesions.It is useful and I thank Zailda for the template.Enjoy. The camping trip tells the story of a family going on vacation and the importance of quality family time. 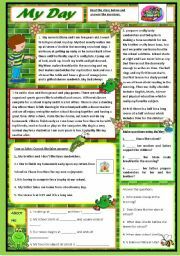 It includes reading comprehension, writing skills and and vocabulary exercises, enjoy! Hugs. 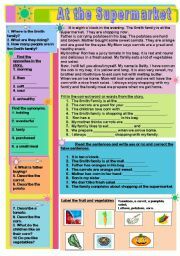 The My Day story is a story basically written in the present simple and can be used to reinforce the present simple and teachers can have children write about their day after learning it. It includes present simple, open questions, true or false exercises and finding information from the text. Very useful. 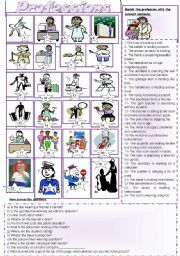 The professions worksheets reinforces the vocabulary as well as the actions they do and it also describes the images that are here.The children use reading and writing skills and also good for present progressive teaching and comprehension. I thank zailda for the lovely template and ESL. Enjoy! The kids will love this creative game, thanks to Phillip Martin the clip art is beautiful, the game is interactive and lots of fun. I did add a written exercise at the end. I also give credit to my student Y for all of the hard work in planning this game. It is great! The Road Safety story is a part of the Road Safety program in English that is a part of the curriculum in Israel. It encourages children to be aware of the dangers in the streets anywhere and everywhere.